In 2014, the Tetrosyl Group turned 60 years old and that meant the iconic T-Cut brand celebrated its Diamond Anniversary. To signify this milestone, we commissioned an original 5 Litre Tin to be encrusted with Swarovski Diamond Crystals by Shirley Sinclair of Crystallized by Request. The delicate work took 75 hours, and in total 26,000 crystals were needed to create this stunning masterpiece. All hand placed, the commemorative tin marks over six decades of successful paint restoration and scratch removal, and long may it continue for generations to come. 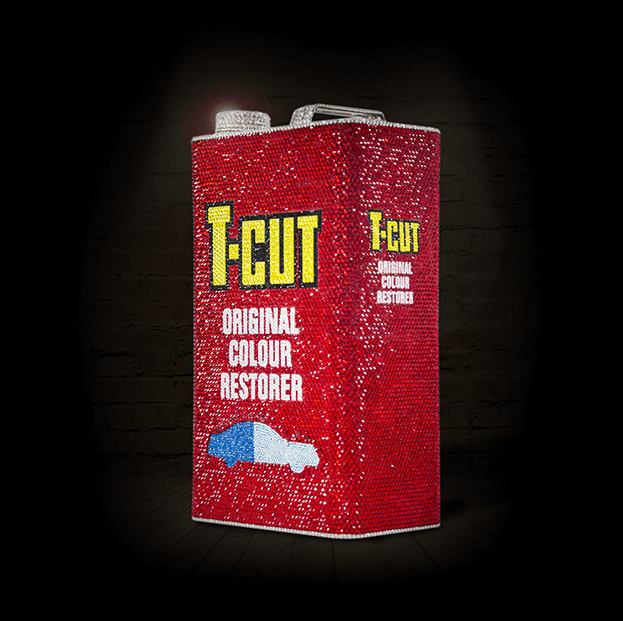 Upon the anniversary, Chairman of Tetrosyl Peter Schofield stated “after 60 years and tens of millions of tins sold T-Cut is so iconic its virtually a verb. To remove scratches or clean paintwork most people say ‘Just T-Cut It’ – that’s why we say it’s the Cream of Britain”. He continued to talk about the production of this very much British product. “In these days of manufacturing decline in the UK we are proud to have been producing T-Cut in Bury, Lancashire since 1954 and will continue this tradition for generations to come to ensure we are very much a part of British heritage and history – Tetrosyl is a private and UK owned company”. The diamond encrusted tin is now on display in Tetrosyl HQ.